SURF SKATE STYLE WITH SCOTT OSTER. I think I first saw “surfskate style” before I remember hearing people talk about it. It was from the mags in the ‘70s, and all the early photos at Kenter. The one photo that really connected that concept for me was Paul Constantineau going through the blue tarp barrel. Surf style to me is interpreting what you would do on a wave in the ocean on land, whether it’s riding down the sidewalk, a bank, a ramp, or a pool. It has a certain flow. People who surf have a natural tendency to carve and draw different lines, and they use more of the terrain. Less back and forth. The first person that comes to mind and was my biggest influence was Jay Adams. He was the best. Olson, Hackett, Alva, and Chris Miller are some of my all-time favorites as well. Haven’t seen enough of the newer guys surf and skate to speak on them, but from photos I’ve seen Pedro Barros and Curren Caples can definitely hold their own in the water. 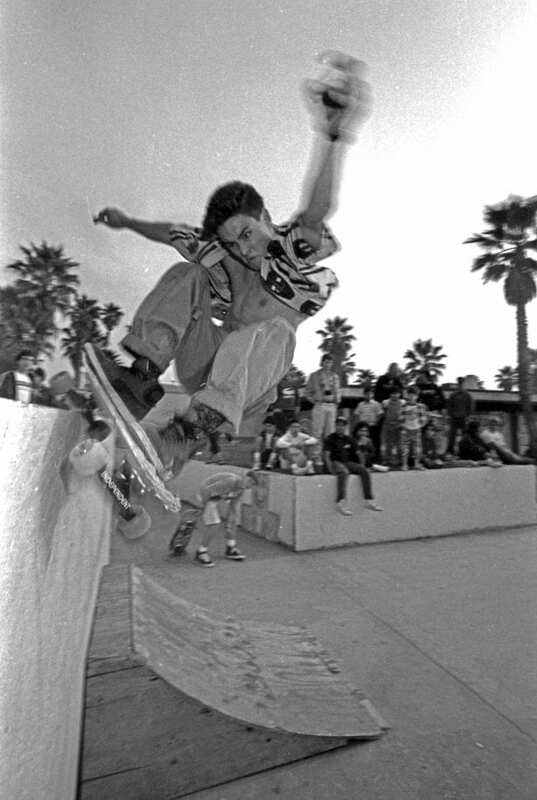 I think Larry Bertlemann had one of the biggest impacts on the ‘70s skaters, especially the Zephyr/DogTown kids, along with Gerry Lopez’s smooth effortless style in critical situations and Buttons’ innovative, radical approach. I think those guys pushed the limit of what was possible for surfing, which in turn influenced skating. That is a big part of the foundation of what skating has evolved into today. A “Bertlemann” done properly on a surfboard or skateboard is still to this day a thing of beauty. How surfing was the roots of skating, skating is the root of what surfing is today, especially with the massive airs and all the variations of reverses. Even doing a floater would be like doing a fifty-fifty or manual grind. It all connects. Style in general is always important. In my opinion, being a surfer gives me a different added perspective when I’m skating. Whether I’m skating a bank or a pool, I imagine myself on a wave. I think it has a natural tendency to smooth out one’s style. Having a surf style when you skate is one of many ways of expression on a skateboard. There are plenty of people that don’t surf or don’t surf well that have great style and do all sorts of innovative ridiculous things. At the end of the day, you can’t fake style. Either you have it or cultivate it authentically, or you don’t, whether you surf or not.